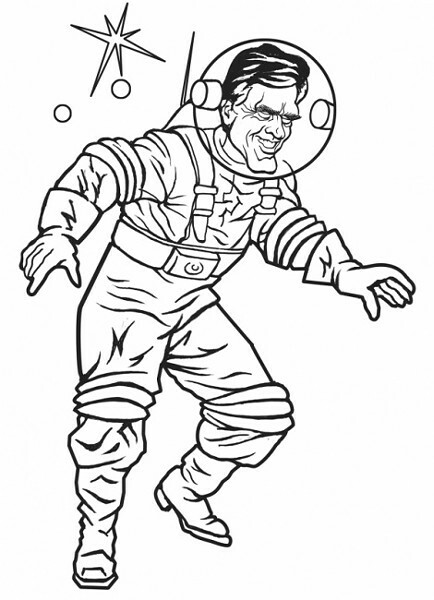 My old missionary companion, Willard “Mit” Romney, startled the nation last Thursday when he declared that if elected president, not only would he commit to sending a man to Mars, but that he himself would be that man. Now that the space shuttle has closed shop, Mit said, America needs a daring new venture. Mit graciously agreed to sit down with me in an exclusive interview to talk about his bold announcement. Mit likes to do at least two things at once, so we conducted the interview during a drive from Salt Lake City, where Mit met with donors and raised several million dollars, to the Romney compound just outside Peoa. Mit also likes to be in the driver’s seat, so I rode shotgun, a tape recorder on the console between us. As always, Mit brought along his beloved Irish setter Seamus, who, as usual, was tied to the top of the car. Deep End: I’m kind of worried about Seamus. Is he all right up on the roof? Mit: Hey, he loves it. Besides, he always gets a treat afterwards, unless he has an accident and sh-ts all over the place. DE: Personally going to Mars was an inspired idea. How did you come up with it? Mit: A couple of things went into the idea, which I have to say is maybe the most brilliant idea I’ve ever come up with, and as you know, I’ve had more brilliant ideas than you can shake a stick at. First of all, you remember how we watched the moon landing together in that rat hole of a flat we had near the Jardin de Luxemburg on our mission. I thought then, golly, I wish I could be the first man on the moon. JFK had gotten everyone excited when he announced the moon mission. That’s the thing I really admired about Kennedy, that, and his wonderful head of hair, of course, which I’ve also tried to emulate. DE: I hope you don’t plan to emulate his hobby of skinny dipping with hot babes in the White House pool. DE: Let’s get back to Mars. What else influenced your decision to go to the Red Planet? Mit: The best book I ever read, except the Book of Mormon, of course, was Men Are From Mars, Ladies Are From Venus. Anyway, I read that book and it was like looking into a mirror. DE: So you felt that you might have been born on Mars? Mit: Not exactly. But I think in the Pre-existence I might have done some sightseeing there. But let me tell you what really got me juiced about going to Mars. There’s this space-scientist guy named Dirk Schulze-Makuch who thinks we should send someone up to Mars right away. His idea is to send older folks in their 60s up there and have them live in ice caves—folks in their 60s because of the radiation that really messes with your organs of generation. Wouldn’t matter with old folks because they’ve already multiplied and replenished. So I said to myself: Hey, Mit! You’re in your 60s, you’ve already multiplied and replenished. Be the first man on Mars! DE: But other planetary scientists, like Dr. Steven Squyres, say Mars is a horrible place, dusty, bleak, barren, desolate, and far from home. Mit: Know what that sounds like? Utah before the pioneers came here and made the desolate desert blossom like a rose. Anyway, I turned around the 2002 Olympics. All by myself! Singlehandedly! I know of a surety that I can turn around dusty old desolate Mars. DE: But you know that at the moment you could only go one way. You’d be stuck there forever. Mit: The pilgrims had a one-way ticket to America. The Mormon pioneers had a one-way ticket here. If they can do it, I can. Besides, it’s not forever. It would just be until I completed my mortal journey. That’s just a blink of an eye in our eternal existence. And here’s my secret plan of salvation: Going to Mars gives me a head start on eternal progression and becoming a god of my own planet. DE: I think Seamus is sick. There’s stuff on the back window. Mit: We’re almost there. The car will be fine. We can hose it down once we stop, and if Seamus is a good dog, I’ll give him a treat.